We are so happy to have you back. Please come in and see the changes. We are so excited!! In a hurry? Why Wait? 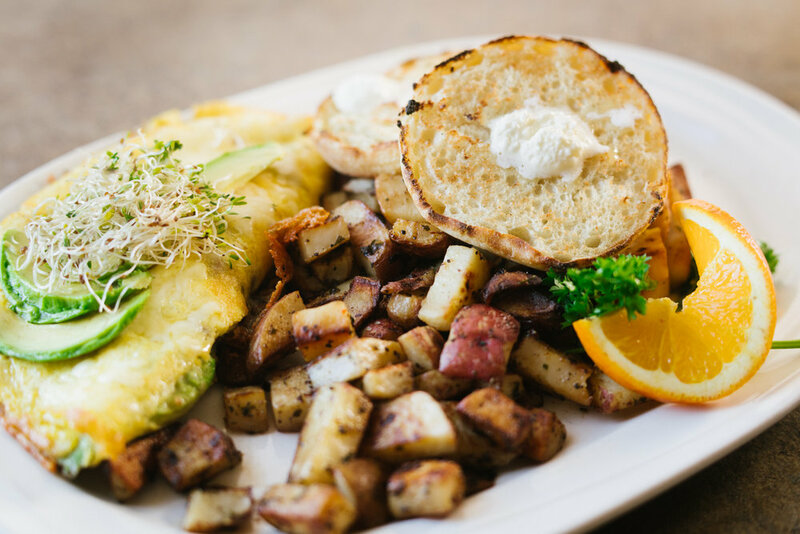 Breakfast at the Hi•Lo is like stepping back in time, with huge portions of homemade breakfast favorites, served with fresh potatoes. Our fresh homemade biscuits are a specialty...try them! 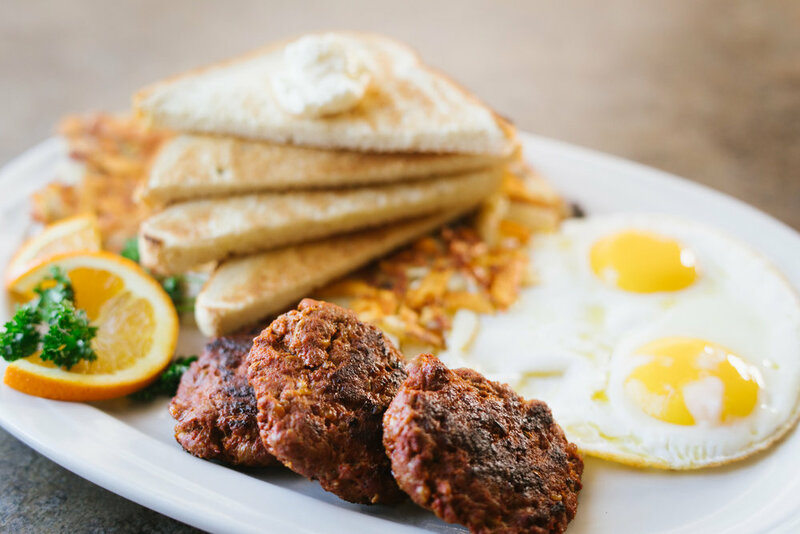 5 large link sausages OR 6 thick-cut slices of bacon, OR a large portion of hickory-smoked ham, OR a huge sirloin burger steak, 3 eggs, plus a mound of hash browns OR home fries, plus two fresh-baked buttermilk biscuits. 10oz. Chicken-fried Steak breaded and deep-fried to a golden brown, topped with homemade country gravy, served with 3 eggs, a mound of hash browns OR home fries, plus 2 fresh- baked buttermilk biscuits. 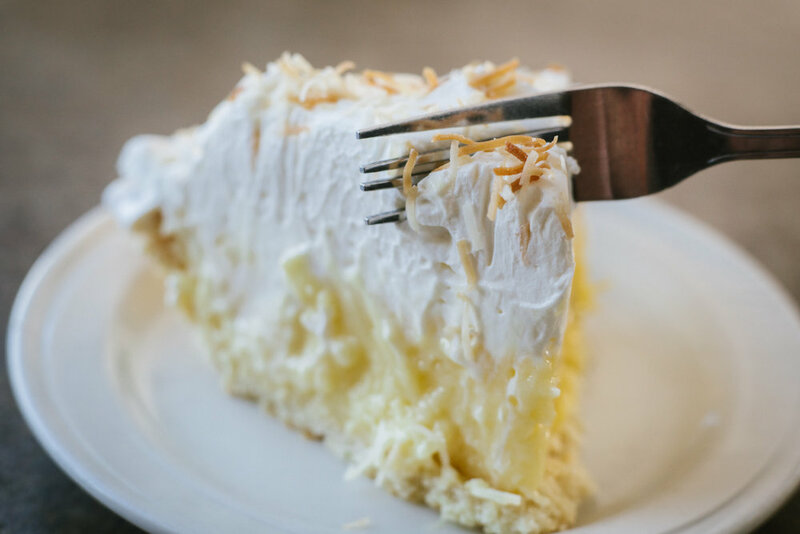 Made from a family recipe has been passed down through FOUR GENERATIONS! Two Eggs cooked any style, hash browns OR home fries, and your choice of toast, English muffin OR homemade buttermilk biscuit. Made fresh daily - no canned hash served here! Stuffed with bacon, sausage, ham, tomatoes, mushrooms and jack cheese. Chock full of our homemade Hot Italian Sausage, jack and cheddar cheeses, olives, onions, and bell peppers... This one will knock your socks off! Our most popular! Avocado, mushrooms & jack cheese. Mushrooms, onion, tomatoes, bell peppers, fresh spinach & jack cheese. Egg Whites or turkey bacon substituted upon request. From our own machine imported from Spain! One poached egg and Canadian bacon on an English muffin, covered in Hollandaise sauce, served with hash browns or home fries. Served with hash browns & 1 slice of toast. With a slice of bacon OR a link sausage. A mountain of a deal! 3 fluffy pancakes stacked tall, with 2 link sausages, 2 pieces of bacon, and 2 eggs on top! 3 slices of thick cut Texas toast, covered in egg and grilled. Scrambled eggs, seasoned ground beef, fresh spinach and onions, covered with cheese. Scrambled eggs, hot or mild Italian Sausage, fresh onions and green peppers, covered with cheese. One biscuit, split, served with sausage and scrambled eggs, covered in country gravy and served with hash browns. Avocado, spinach, tomato, onion, green pepper, mushrooms and jack cheese. Fresh tomato, onion, mushrooms, green pepper, fresh spinach and jack cheese. Choice of seasoned ground beef, pulled pork or grilled chicken with scrambled eggs, jack cheese, Ortega chiles, rolled into a large flour tortilla and served with our homemade salsa. Our Family's homemade hot Italian sausage served with scrambled eggs, diced potatoes and jack cheese, rolled in a large flour tortilla. Served with 2 eggs, any style! Build them the way you want! Choose one from each list. Belgian Waffle, Pancakes, French Toast, or 2 Biscuits & Gravy. 2 Pieces Bacon, 2 Link Sausages, or 1 Ham Steak. All sandwiches are served with your choice of fries, homemade cole slaw, potato salad, cottage cheese, or small side salad (unless otherwise noted*). Substitute sweet potato fries for $1.49 more. Add a trip through the salad bar for $3.99. Choice 10 oz. New York cooked to perfection and served open-faced on a French roll. Grilled lean roast beef, onions, bacon and Swiss cheese, served on a French roll with au jus. Plump chicken breast with bacon, avocado, lettuce, tomato, Swiss cheese and mayonnaise. Triple-deckered on your choice of bread! Served on a French roll with avocado, tomato, lettuce and Swiss cheese. Chicken breast with melted jack cheese, grilled tomato, pesto & mayo on a French roll. Sliced corned beef, grilled and covered with melted Swiss cheese and sauerkraut, served on grilled rye. Thinly sliced roast beef served on a French roll with au jus. Breast of chicken & Swiss cheese served on grilled sourdough with tomato, parmesan cheese and our own Caesar dressing. Tender pulled pork lathered in BBQ sauce and stacked in a French roll. Covered in fried onion rings...delicious! 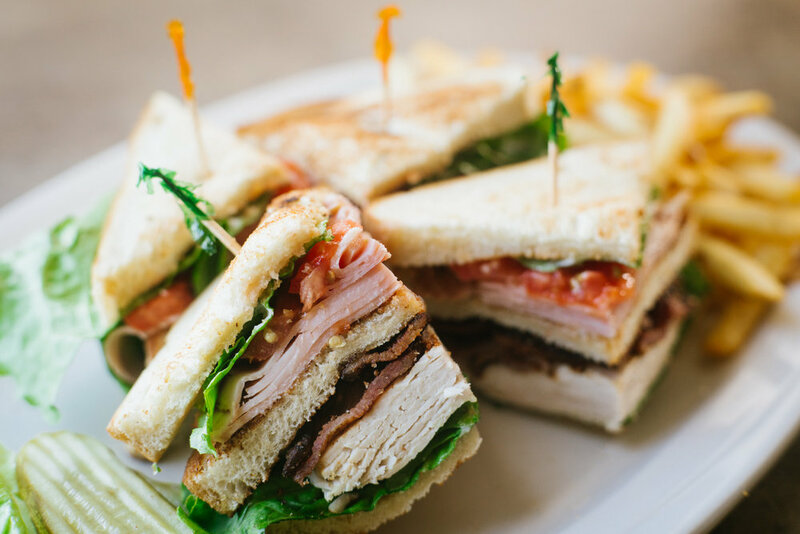 Triple-decker stacked with lots of sliced turkey breast, bacon & ham, with tomatoes & lettuce. Triple decker served with bacon, lettuce, avocado, Swiss cheese, tomato and mayonnaise. Served open-faced with mashed potatoes, vegetables & gravy. Turkey, fresh cucumbers, tomatoes, avocado, and cream cheese served on whole wheat. Turkey, ham, bacon, American cheese & tomatoes on grilled sourdough. All of our hamburgers are made with 7 oz. of fresh ground beef, charbroiled or grilled. Your choice of fries, homemade cole slaw, potato salad, cottage cheese, or small side salad (unless otherwise noted*). Substitute sweet potato fries for $1.49 more. 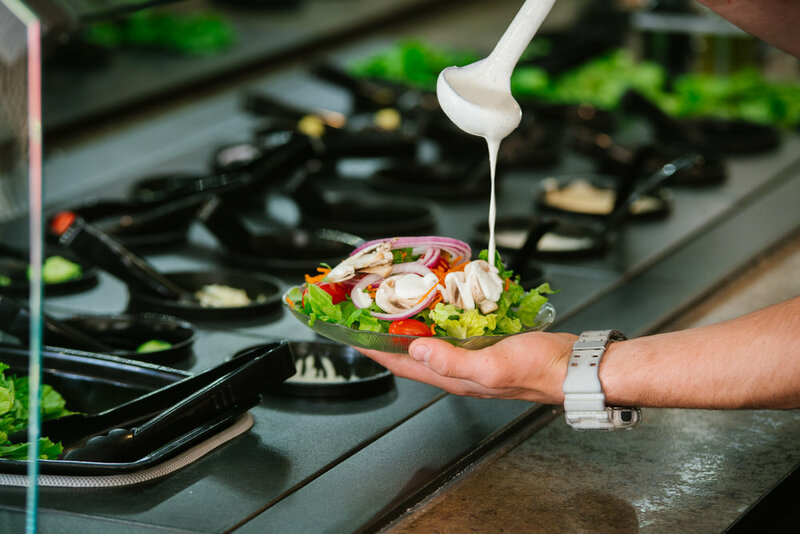 Add a trip through the salad bar for $3.99. Substitute a Gardenburger™ at no extra charge for any burger upon request or a chicken breast for just $0.99. Add an egg to any burger for 1.29. Gluten-free bun available for 1.00 extra! A HUGE 10 oz beef patty served with grilled onions, tomatoes, lettuce, pickles. Margaret says this one will fill you up! Add bacon 99¢. Add cheese 99¢. Served on a grilled French roll with Swiss cheese, bacon, tomatoes, lettuce, pickles, and red onion. Served open-faced with cheese, & onions. Covered in bleu cheese and bacon! Covered with BBQ sauce, sliced American cheese and 2 of our onion rings... great! Grilled sourdough with parmesan cheese, served with Swiss cheese, tomatoes, and onion. Covered with sautéed mushrooms & Swiss cheese. Served on grilled rye bread with Swiss cheese and grilled onions... a true classic! Grilled, old fashioned 5 oz burgers with onion, tomato, lettuce, mayo and Thousand Island dressing, topped with American cheese and wrapped in paper, served with fries! Two fillets, served with fries, cole slaw, or potato salad. 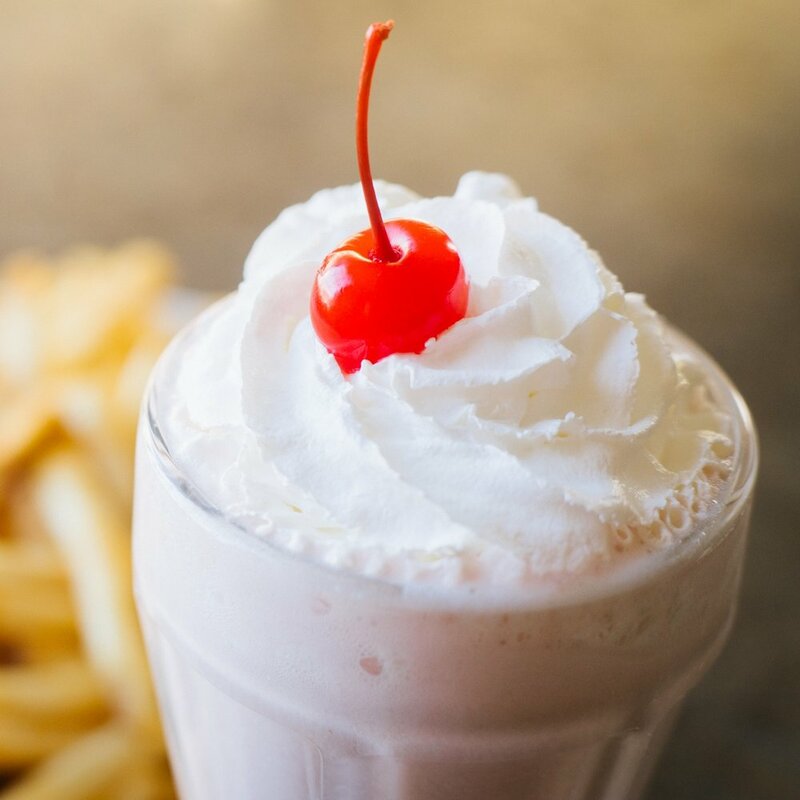 Add a Hand Dipped Shake* and get extra in the tin for just 4.49! (Chocolate or vanilla) Offer good ONLY with the Basket Combos! Served on grilled sourdough bread with swiss cheese and tuna salad. Choice of tuna, ham, turkey, or lean roast beef served with a bowl of soup. Four choice fillet strips, breaded and deep fried. We toss mixed greens into our creamy Ranch dressing and top it with tomato, egg, avocado, jack and cheddar cheese and our "Spicy" Buffalo Chicken. We toss mixed greens lettuce into our creamy Caesar dressing and top it with homemade croutons and Parmesan cheese. Choice of seasoned ground beef, pulled pork, or grilled chicken served in a tostada bowl with fresh mixed greens, avocado, tomatoes, olives, cheese & side of salsa. Bleu cheese, bacon, turkey, mushrooms, avocado, tomato and egg, served on a bed of mixed greens, with your choice of dressing. A great salad bar with countless veggies, homemade salads, fresh fruit, and cheeses. One time through. Topped with onion and cheese and served with homemade garlic bread. 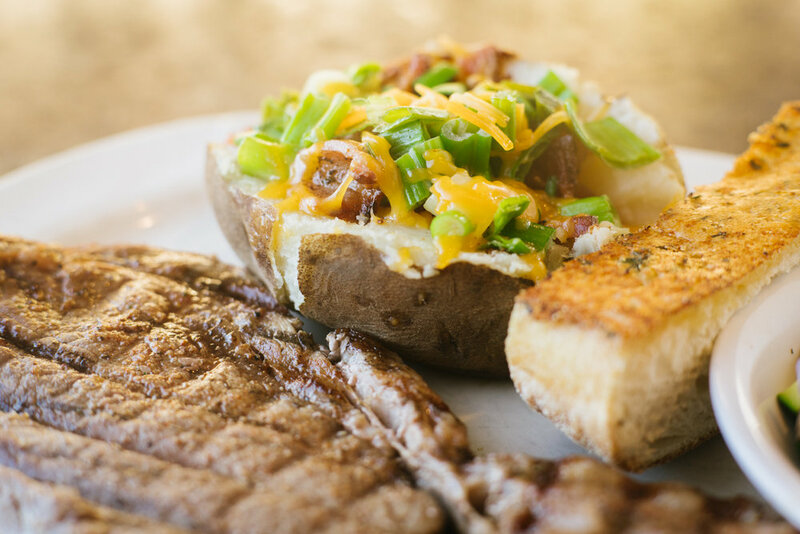 All Dinners are served with a choice of fresh Mashed Potatoes, Baked Potato (after 4 pm), French fries; homemade garlic bread & fresh vegetable, (unless otherwise noted*), or Sweet Potato Fries for $1.49 extra. Filet of salmon, grilled to perfection, topped with lemon butter sauce. A 10oz. cut of a Southern style favorite! Just like Grandma used to make! Mouthwatering, slow cooked beef, tender red potatoes, mixed vegetables, covered in rich brown gravy. Three Corona™ Beer Battered fish fillets deep-fried to a golden brown. Served with fries and slaw. Using a recipe passed down for generations! We roast them fresh every day! Pounded chicken breast, lightly breaded and cooked to a golden brown. Cooked to golden perfection, served with cocktail sauce & lemon. For those who love liver: you’ll love ours! Two large portions covered with grilled onions and topped with 2 slices of thick- cut bacon. Diced red potatoes with sauteed bell peppers, green onion, mushrooms, zucchini and squash, topped with jack & cheddar cheese, diced tomato, avocado & dinner bread. Add three breaded and butterflied shrimp for just $2.99. A select hand-cut boneless rib eye cooked on our open broiler over an open flame. Served from 5pm until they're gone. We slow cook half rack of our pork ribs, cover them with our tangy BBQ sauce, and finish them off on our hot broiler. Prime Rib Specials - Friday & Saturday Night Only! Served from 5pm until it's gone. Slow cooked the old-fashioned way! Served with au jus and horseradish. Chicken & mushrooms in Alfredo sauce served over fettucini noodles, topped with Parmesan cheese. Chicken-fried chicken, melted jack cheese over fettucini noodles and spaghetti sauce, topped with Parmesan cheese. Tender strips of beef and mushrooms cooked in a sour cream sauce and served over noodles. Add grilled chicken breast for 1.99. With mashed potatoes, vegetable and bread. Two fillets, served with fries and cole slaw. Choice of potato, vegetables & garlic bread. Huge plate of fries, with chili and cheese. Huge plate of fries covered with fresh chopped garlic. Cucumbers, grape tomatoes, croutons, and your choice of dressing. Server prepared (not salad bar). (free refills) Pepsi, Diet Pepsi, Dr. Pepper, Sierra Mist, Root Beer, Mt. Dew and "Nicolishous" (a delightful mix of Cranberry Juice & Sierra Mist). For current selection, ask your server. Made with hand-dipped ice cream and you get the extra in the mixer cup! The Hi-Lo Motel & Cafe has been a family owned and operated business since 1951. Frank Rizzo, born in Italy, moved to the United States when he was just eight years old. Years later he married his wife Gene. Soon after, they purchased the old Pilgrim’s Rest Motor Court and transformed it into the Hi-Lo Motel & Cafe. Frank was never afraid to take a chance. He taught his children the formula for good business and community involvement. Frank himself once served as the town’s Mayor. He made sure his children learned the value of hard work. Frank and Gene’s daughter, Margaret, took over the business in 1971 continuing the tradition of family stewardship and community involvement. Margaret’s commitment to community includes decades of participation with the Weed Chamber of Commerce, College of the Siskiyous Foundation Board, Sons of Italy, North Valley Catholic Social Services Board, Weed Long Term Recovery Group (Boles Fire, Sept. 2014), Weed Pride (downtown revitalization), and the Family & Community Resource Center of Weed just to name a few. All of Margaret’s children and several of her grandchildren have worked the family business. A few of them still do to this day. 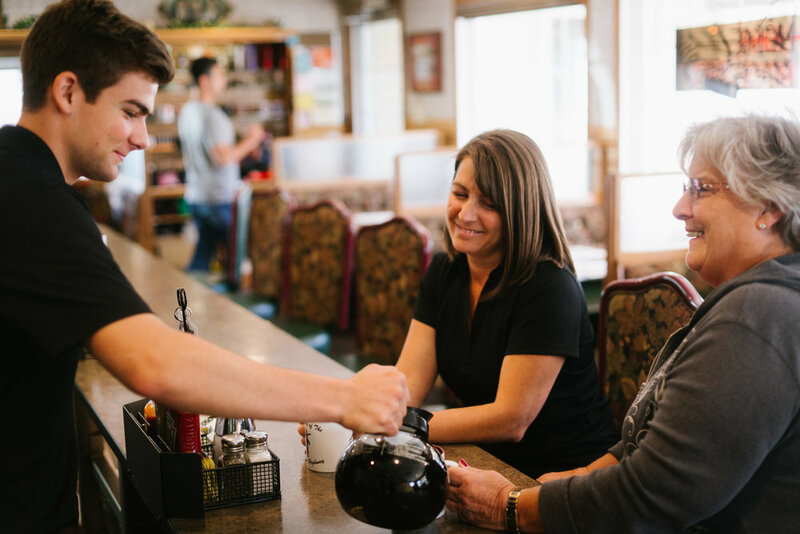 As you look around the cafe many of our employees and customers are like family spanning decades of employment and patronage at the Hi-Lo. Over 65 years of faithful service to this community. The Hi-Lo Motel & Cafe continues to look forward as the third generation of family begins to take an active leadership role. This is our home, our community. We value our friendships, our town, and the relationships built over six decades of business. So, whether you are visiting us for the first time or have been coming to the Hi-Lo for decades we welcome you! The City of Weed gets its name from the founder of the local lumber mill and pioneer Abner Weed. Abner discovered that the area’s strong winds were helpful in drying lumber. In 1897, Abner Weed bought the Siskiyou Lumber and Mercantile Mill and 280 acres of land, in what is now the City of Weed, for the sum of $400. The town was incorporated in 1961. In 1971 the town’s Mayor, Frank Rizzo, proposed changing the name to “Shastina.” This stirred up a hornet’s nest of opposition and discussion regarding the future of the town. It drew national attention in the press shining a spotlight on this peculiar named community. Ultimately the proposal was defeated and the town has since embraced its unique and occasionally controversial name. Many people have asked how the Hi-Lo got its name. Most assume that it is a play on the town’s colorful name and its implied meaning. Not so! 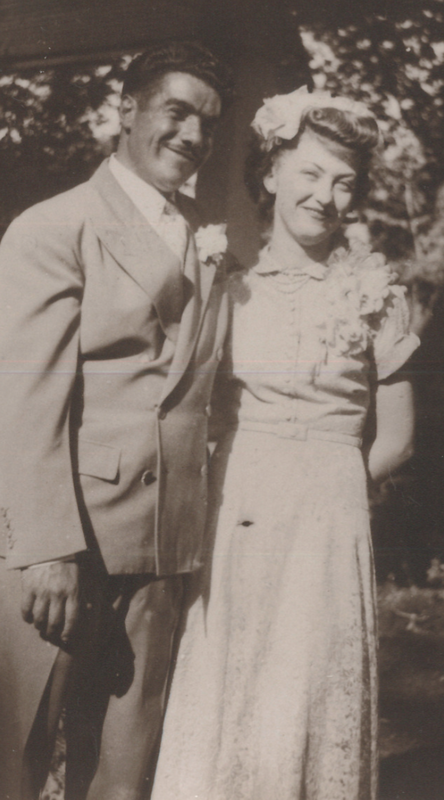 In the early 1950’s Gene and Frank Rizzo pooled together what little money they had saved and purchased the “Old Pilgrim’s Rest Motor Court.” They continually invested in their business working diligently to remodel and improve the property. The rooms at the top of the hill were renovated first and were thus priced “higher” than those located at the “lower” part of the hill. New signage was also priced by the letter so a shorter name, Hi-Lo, was born. 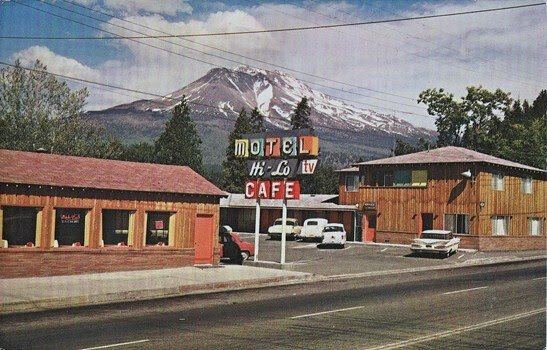 Although there is no distinction between our higher and lower properties today, we still take tremendous pride in the Hi-Lo Motel & Cafe and the incredible community that made it what it is today.